Good Evening! We are back with our 3rd dose of awesome inspiration this evening! I was super inspired when my Visible Image DT kit arrived (and just a little blown away at the awesomeness of the stamps). I got very excited as, even though they’re sold in sets, they are so interchangeable and many of the images and sentiments can be used in different ways… which, as a crafter, is just fabulous! The ‘Somewhere in Time‘ set really caught my eye. I love the fractured pocket watch… it seemed to represent how I’m feeling at the moment. Love this card.. the colours are so stunning together and all the background stamping looks fantastic. You will find more of Heather’s gorgeous projects over on her blog. We will be back tomorrow with the very first project from Lisa Taggart! If you missed any of our earlier posts today, you’ll find them HERE! The Visible Image ‘Splash of Colour’ challenge runs over in the Facebook group throughout July. All you have to do is make a card or project using Visible Image products, adding your interpretation of ‘a splash of colour’, and upload it into the dedicated album. I for one can’t wait to see what that looks like, once everyone gets creating! It’s going to be glorious! I also used 5 colours of Tim Holtz Distress Oxides and a Versafine Onyx Black ink pad. First I ‘splashed’ my colour by laying a square of ink from a pad onto my glass mat and spritzing with a little water. 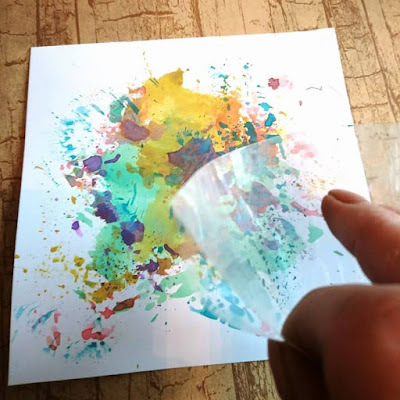 I then used an old small poly bag to pick up the ink and apply it randomly around my cardstock. drying in between colours. Once I was happy with my end result I stopped dabbing. 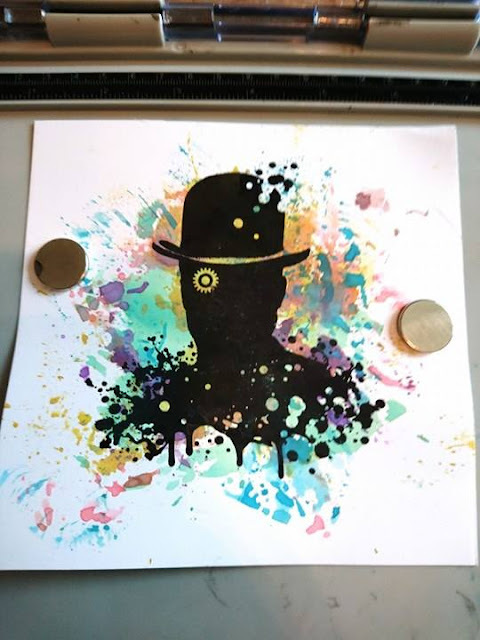 I used my Tim Holtz stamping platform to get a really good print from my bowler-hatted man. I did him three times to be sure but two would have been enough, as you can see, careful re-inking gets an incredibly black result! All that remained was to use the letters and characters from the Alphabetical set to complete my project. I also stamped the two past and future images from Ahead of our Time onto spare card and stuck them down with 3D foam. I look forward to seeing all the contributions to the ‘Splash of Colour’ Challenge – don’t forget there is a prize draw at the end of it all too! The extras in the alphabet set are so great for backgrounds, from the scribbled frames to the punctuation marks. Why not randomly jumble the letters up on your block to create your own unique background too! 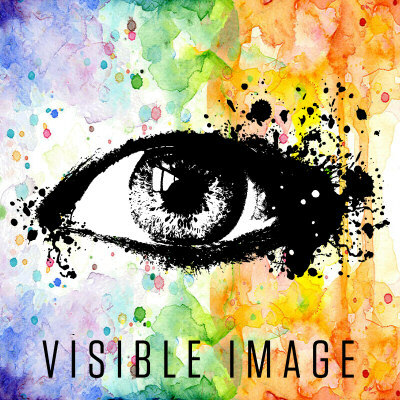 Make sure you share your Visible Image creations with us in our Facebook group, or tag us on instagram@visibleimagestamps and on twitter @visible_image! Hope your weekend has started well. I’ve had a busy week at the office, but luckily in the evenings there has been some balancing time for crafting, too. That’s so important to me! For colouring the background I used several colours of Distress sprays, mixed with water before drying with my heat gun. The main image is stamped and heat embossed; I have found that heat embossing works the best if you want to create a really dark stamped image on a mixed media background. For decorating the background I used Distress inks and two new Visible Image background pattern stamps. The ink colours were the same I used for misting, as I did not want the background textures to pop up too much. The contrast between the lighter background and the dark black image was the main thing for this card anyway. The circle on the man’s eye is a metal washer (one that you can buy at any hardware store). It’s original colour was silver, but as it did not match to the colour palette of my project I heat embossed it with gold colour embossing powder: I dabbed the washer on the VersaMark ink pad, dropped it in the embossing powder jar, and picked up using a toothpick. Heating the metal ring took a bit longer than usual, but the embossing powder melted beautifully on the washer changing it’s colour completely. Wishing you a wonderful day. Thanks for stopping by! We will be back a little later with more fantastic projects to inspire you! Hello! We hope you are having a great weekend! 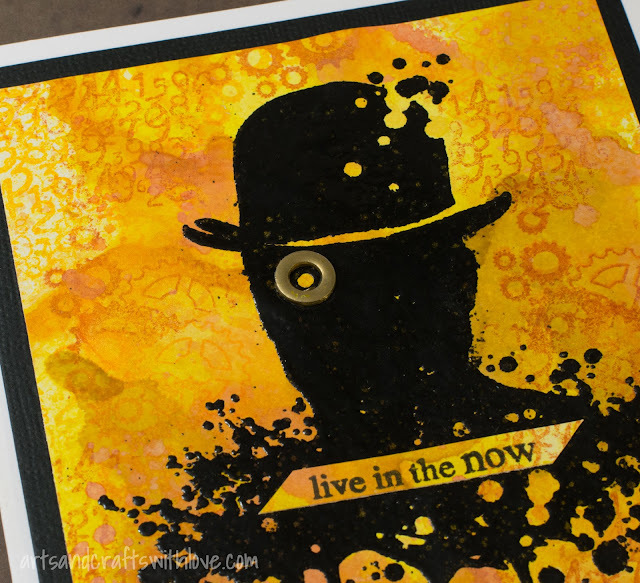 I have an art journal page to share today using the lovely new stamps by Visible Image. I love the alphabet stamps, there are more than one of certain letters so that makes is easy to stamp words like ‘happy’ etc. I stamped them a little wonky but you can line them up really well. I used a mop up page from my gelli print stack. I really like these; sometimes they are even nicer than the proper prints. 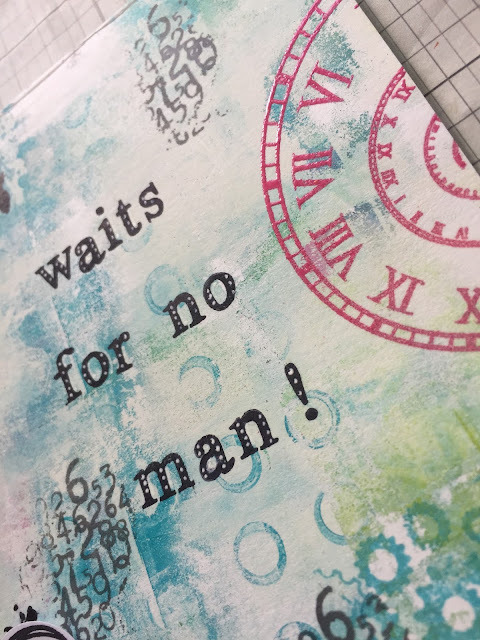 I added some background stamping using Archival ink and the pink clocks were heat embossed with pink embossing powder by WOW. The letters are stamped on white paper, I then added the circles around them. There is a circle and a square in the set and the letters fit in there perfectly. I used a punch to cut them out. I like my words to be wonky so I stamped them wonky on purpose. I added some white dots with a white pen. That was it from me today ! You also still have time to play in our monthly challenge where the theme is ‘Dimension’. I have put my letters spelling ‘time’ on dimensional tape so they stand out more. You will find more of Corrie’s fantastic cards and projects over on her blog. Don’t forget to show us what you have been creating with our stamps over in our Facebook group … enter our challenges for your chance to WIN a coupon! Next we have a gorgeous tag from Veerle Moreels featuring our Face stamps. I’m here with a fun card that I’ve made using all three of the NEW stamp sets from Visible Image. And the large splat from the ‘Somewhere In Time’ set was used to create a border and to add some numbers to the background. Just the edge of the spat in this set was used. What I like is that you can use a little, or lot, of the splat to create a border. Brilliant card… loving the James Bond theme! How awesome does our man look stamped in those oxides! You will find more of Dot’s stunning cards and projects over on her blog. Dot also sells our whole range of stamps over in her Etsy store in Australia! Facebook group join in with the banter and enter our Monthly Challenges for a chance to win a great prize! We will be back tomorrow with more gorgeous inspiration for you! Enjoy the rest of your day and thanks for visiting us here on the Visible Image blog. When you first see new released stamps all those ideas start spinning around in your head. Especially when seeing all these lovely words in the ‘Somewhere in time’ set. I’m a sucker for word…and have a soft spot for strong words. And one of the first ideas when seeing the clock in ‘Ahead of our Time’ was this… trying to create a fossil look. As the shape of this clock immediately reminded me of that shape of old fossilized shells. To get the word time to pop up I stamped it onto paper and fussy cut them out. Another layer of texture ^.^ Remember the June challenge over at Visible Image is called ‘dimension’ …you can still join in for your chance of winning a £40 coupon! We will be back soon with more fantastic inspiration! Thanks for visiting us here on the Visible Image blog today. Hi there! Thanks so much for coming to check out today’s inspiration here on the Visible Image blog! this Friday, June 9th at 11am & 4pm! …Not to be missed!!! Mark and Pauline have some superb demos lined up! You can watch our show on catch up for 7 days online too! There have been so many amazing projects created with our NEW stamps, and there are lots more to come from our awesome team… if you have missed any of our recent posts you’ll find them HERE! We have more gorgeous inspiration for you tomorrow, thanks again for stopping by today. Hello there! We are back with more awesome inspiration for you… a little later than planned sorry but better late than never!!! I’m so excited to share my first make with the amazing new set from Visible Image called ‘Somewhere in Time‘. These stamps are launching on Create and Craft TV this Friday, June 9th! It’s going to be an awesome weekend! For this 7×5″ card I started with an A6 piece of white, stamped the smashed pocket watch and then masked off the whole thing with Pebeo Drawing Gum. Once I had allowed this to dry I went crazy with colour – Wild Honey, Spiced Marmalade and Carved Punpkin, adding detail to the background and some coiled springs in black to the foreground. Then I simply rubbed off the gum and added a hint of colour to the workings behind the watch face. I also prepared the base card too, but only the inch around the edge, as once the design is mounted, that’s all there is to see! The designs and words in this set are amazing, I am going to investigate more with different phrases, as there are so many ways to work with them, and indeed the other two NEW sets! Get your orders in as NEW Visible Image releases are notoriously popular and have sold out time and again on Create and Craft! 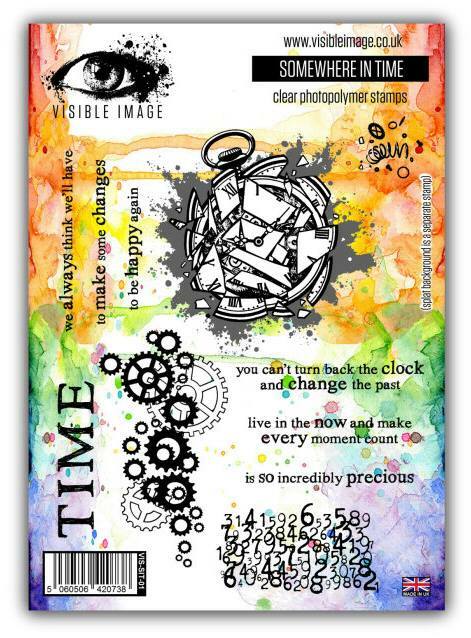 We will be back with more awesome inspiration this evening showcasing another stamp set on this Friday’s show! Hello! We are back, as promised, with more brilliant inspiration for you! Well, I managed to get my hands on the brand new stamp designs from Visible Image, and had a very quick play, they are rather awesome. I achieved the background by brayering some very florescent green and Pink paint, dried it with my heat tool, then I stamped the cogs using Black Archival ink. I stamped the man and sentiment with Versamark, and heat embossed them using a green florescent embossing powder. There’s the chance to WIN one of our awesome NEW Stamp Sets over on our Facebook page this weekend! And don’t forget to enter anything you have made with our stamps this month into our ‘Show & Tell’ challenge, or play along with our DIMENSION themed challenge… both have great prizes up for grabs over in our Facebook group! We will be back later with Nicky’s first project created with these NEW stamps! Hi there! Thank you for visiting our blog today. We have more awesome NEW stamps inspiration this weekend.. everyone here is loving creating with these brilliant designs! If you have already pre-ordered yours you will be getting your hands on them soon! 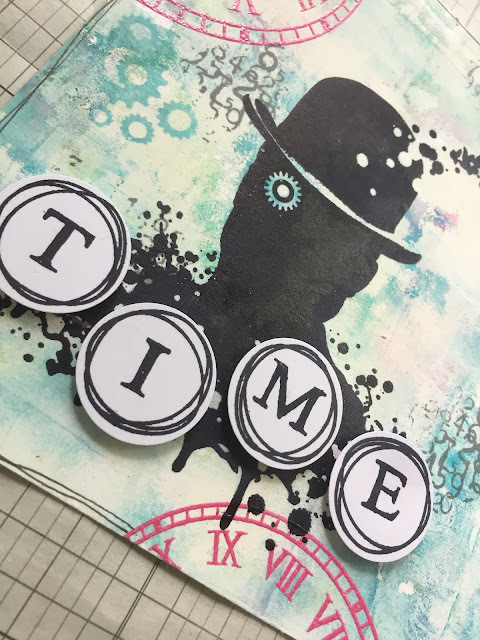 Mark has created a superb card with the ‘Somewhere in Time‘ set… and he will be demonstrating how he made this on Create and Craft TV next Friday, June 9th! The awesome inky splat you can see here is a separate stamp which works brilliantly with so many of our stamp designs! The number background and cogs with be ‘go to’ stamps for many many projects! These NEW stamp sets are A5 in size and the stamps are HUGE! These incredible stamps will be released on Friday June 9th. More details of all 3 of our new sets HERE! Thanks for stopping by, we will be back later with an amazing card from Pauline, an awesome card from Nicky, and this weekend we will also be sharing some 3D inspiration for this month’s DIMENSION challenge over in our Facebook group …..we hope you will play along for the chance to WIN a £40 coupon! Wow we are so happy that you are loving our NEW stamps so much!!! Thank you for all your amazing comments, messages and emails! the brilliant time spiral, create a doorway to a new future…! 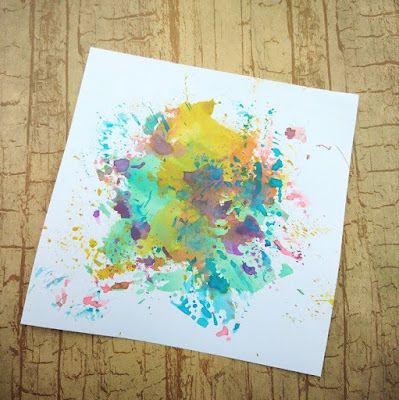 and that large inky splat (which is a separate stamp) is so versatile! punctuation marks and scribbled style frames, it really is a ‘must have’ alphabet! they have so many brilliant demos planned with these NEW stamps and more! PRE-ORDER YOURS HERE! Just enter coupon code: ITSTIME at the checkout! You can watch our latest Facebook LIVE video over on our Facebook PAGE! or complete our Trade Application form HERE! Thanks for visiting our blog today.. we’ll be back later to share one of the first projects created with these awesome NEW stamps! Hi! We have another preview of our NEW stamps here on the blog today! Incredible stamps with endless creative possibilities! And as you can see, they work brilliantly with those awesome cosmic backgrounds that are so much fun to create! We hope you will join us for a Facebook LIVE tomorrow, Monday May 29th at 8pm (UK time) over on our Facebook PAGE... we’ll be showing you the new stamps, and we’ll have all the details you need about this launch! Hi! We have another preview of our NEW stamps for you today! We are so excited about this set, it is totally different and (dare we say it ourselves) absolutely brilliant!!! If you love this image then just wait until you see the rest of the stamps in this set! We are launching our NEW stamps on Friday June 9th on Create and Craft TV… Mark will be joined by Pauline Butcher for lots of brilliant demos! Hello there! Thank you for visiting our blog today, we have some exciting news!!! Here you can see some of the stamps from our NEW ‘Somewhere in Time’ set!